Parking: Limited roadside parking in a lay-by on the Thornton-in-Lonsdale to Dent (Kingsdale road) about one and a half miles north of Ingleton (grid reference SD 691 758). The walk begins in a lay-by on the Thornton-in-Lonsdale to Dent road (commonly referred to as the Kingsdale road) about one and a half miles north of Ingleton. From the lay-by, head north along the road, heading away from Ingleton in the direction of Whernside itself. Follow the road around to the right as it descends, and then turn down a walled grass track to the right, which after one hundred yards crosses a wooden footbridge over the river Twiss. Carry on along the walled grass track and pass through a wooden gate, then a metal gate. 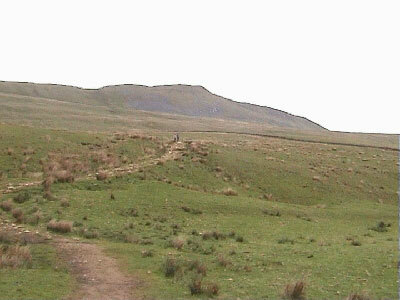 The well-defined path that comes in from the right-hand side, and is clearly visible over to the right is the top end of the Ingleton waterfalls walk, which briefly joins the route of this walk. Ahead up to the left on the hill two weathered trees can be seen on the horizon with a path just below them. This is the route to be taken. Continue along the track passing through a metal kissing gate. A further two hundred yards along the track a house comes into view ahead at a point where about twenty yards up the hill on the left a solitary large boulder resides. At this point turn back diagonally left up on to the hillside almost doubling back on the original route onto a well-defined grassy path. The path winds its way up grassy hillside, and when Ingleborough starts to appear in front, it swings around to the left and begins to weave its way through the exposed limestone pavement. The path splits and a further hundred yards on comes back together just before passing about twenty yards to the right of a solitary tree. The path is currently almost bisecting two parallel walls, which are running along about one hundred and fifty yards either side of the path. There is now an excellent view over to Ingleborough over to the right with the large areas of limestone pavements at its base. The path now winds its way through areas of limestone pavement, and as it flattens three cairns come into view on the horizon. Just before reaching these cairns, ignore the grassy path that ventures off to the right up to the cairns, and keep on the stoney path through the pavement. Shortly after the limestone pavement ends at Ewes Top, the main path continues on straight ahead. Ignore this and take the grassy path which veers off over to the left to pull in alongside the dry stone wall. The wall acts as a backbone to this whaleback hill. This wall is now followed for the next few miles to the summit of Whernside. Over to the left (west), the triangulation point on Gragareth can be seen, and following the ridge northwards Great Coum. The view though is dominated by the great mass of Ingleborough to the right (southeast) surrounded by the masses of limestone pavements. The route upwards is a gentle climb for most of the way, though walking can be harder in places because of the wet and peaty conditions underfoot. The climb starts to become steeper up onto West Fell, where more shake holes and Little Hard and Great Hard pots are passed. The path then goes over a wooden stile and now down below in the distance the Ribblehead Viaduct can be seen. At the foot of the next much steeper climb, there is a path off to the right. This is the return path to be followed down to Bruntscar Farm below. Ignoring this, stick with the wall and climb steeply up past Low Pike and then High Pike. Cross over another wooden stile and continue ahead to the summit. At the summit, the triangulation point is through a narrow gap on the far side of the wall. There are also now recently built seating areas on either side of the wall to use to shelter from the wind. From the summit there are fantastic panoramic views, not only of the immediate three peaks area, but also towards the Lakeland hills, out towards the sea at Morecambe Bay and down towards Pendle Hill to the South. Retrace your steps now back down the final few climbs and over the stile, and continue to where the path splits (grid reference 734803) and the left-hand fork leaves the wall. In bad visibility, the best return route would be to follow the wall all the way back down to the start at Twistleton Scar End. The path drops steeply down towards Bruntscar, passing over either of two stiles before becoming less steep. The path winds its way down the hill to pass over a further high wooden stile next to a gate. The track now initially bends around to the right by two very large boulders and then splits. Take the right-hand fork following the bridleway sign for "Scar End 3½ miles" along the track, which runs back along the base of Whernside. The left-hand fork here heads downhill eventually coming out near the Hill Inn public house, and is part of the three peaks route. Follow this right-hand fork along a lane for about half a mile and pass through a wooden gate into Ellerbeck farmyard. Continue ahead through the farmyard turning to the right between the house and a barn, then follow around to the left and exit via a metal gate. Keep on this track past another barn after thirty yards, and continue down alongside some trees. Pass over a cattle grid and continue straight ahead on the same line parallel with the base of Whernside ignoring the lane which bends around to the left. The grassy way-marked path now slowly climbs running parallel with the Whernside ridge up to the right, affording different views of Ingleborough over to the left. After about one and a quarter miles the path again starts to wind its way through the limestone pavements. Before reaching the pavement, the three cairns passed near the start of the walk come into view on the horizon. The path passes to the left of a large stone boulder and continues ahead towards the three cairns passing between six further large boulders bordering the path. The path continues ahead and at Ewes Top picks up the original path followed at the start of the walk just before entering the more defined area of limestone pavement. Go on down through this and again pass by the solitary tree before swinging around to the right at the top of Twistleton Scar End. Carry on down the path as it winds down the hillside to the track below. Turn right onto the track and pass back through the kissing gate. Keep on the track through two further gates, over the wooden footbridge and turn left back onto the metalled road. Follow the road up and around the final two hundred yards back to the parking area.